The scientist in the kitchen tells us more about what makes our foods tick. 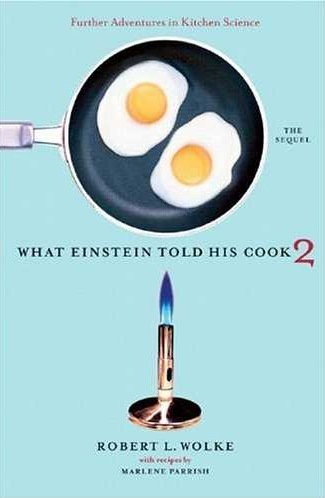 This sequel to the bestselling [%bookLink code=0393011836 "What Einstein Told His Cook"] continues Bob Wolke's investigations into the science behind our foods — from the farm or factory to the market and through the kitchen to the table. In response to ongoing questions from the readers of his nationally syndicated Washington Post column, "Food 101," Wolke continues to debunk misconceptions with reliable, commonsense answers. He has also added a new feature for curious cooks and budding scientists, "Sidebar Science," which details the chemical processes that underlie food and cooking. In the same plain language that made the first book a hit with both techies and foodies, Wolke combines the authority, clarity, and wit of a renowned research scientist, writer, and teacher. All those who cook, or for that matter go to the market and eat, will become wiser consumers, better cooks, and happier gastronomes for understanding their food.